I’m Evangelical, though perhaps barely so, and am thus the odd man out around Orthodox campfires, but I’m steadily learning to appreciate the warmth of the theological vision of the Fathers. Lord knows my Evangelical upbringing bequeathed me no real sense of transcendence. To make up for that loss I had to venture beyond the resources of my denominational identity and step into the deeper streams of tradition. If I were asked to name an issue upon which Orthodoxy has exercised a particular influence, no one here will be surprised to hear me say Christology. And even this can be unpacked into distinct concerns. What I’d like to do here is reflect upon two terms in which Christians contemplate the sufferings of Christ. Mind you, I was raised on a diet of penal substitution. Being holy and just, God’s wrath had to be poured out upon guilty sinners, but being loving and gracious, God also desired our reconciliation. How could God accomplish both my judgment and my reconciliation? Enter penal substitution: God suffered in our place (there’s the substitution) the punishment (there’s the penal dimension) we deserve, that punishment being sin’s wages (Rom 6.23), death and the godforsakenness of our fallen condition. This is not a view I hold today, and part of my movement away from it was my growing appreciation for the unity, and thus the indivisibility, of the saving efficacy of Christ’s entire Incarnate journey – birth, death and resurrection. So let me say up front that though I’m focusing here on how it is, as Paul says, we are “reconciled by his death” (Rom 5.10), I recognize that we are nonetheless “saved by his life” as Paul says with the same breath. I hope to show that penal (but not only explicitly penal) understandings of the Cross are irreconcilable with that participatory mode of relation to Christ’s sufferings expressed clearly in the NT. One term we use to reflect upon the Cross is the concept of substitution. Jesus dies “because” of our transgressions (Rom 4.25) and “for us” and “for our sins” (Rom 5.8; 1Cor 15.3; 2Cor 5.21; 1Pet 3.18). It’s argued that the notion of substitution derives from the use of relevant prepositions (anti, hyper, dia) variously rendered “for,” “because of,” “on behalf of,” “instead of” and “in the place of.” These prepositions may not get us a penal substitution, but some notion of substitution seems to be at work. Another resource for substitutionary thinking is Israel’s entire sacrificial economy as thought to be interpreted by the author of Hebrews. Jesus bears our sin away, a sacrificial lamb, thus fulfilling that economy by being the penultimate instance of the kind of sacrifice upon which that system supervenes. The combination of substitution and participation seems self-contradictory, for on the surface of it they represent two contrary modes of relation. Substitution presumably excludes us from that fate which our substitute bears on our behalf, while participation involves us in sharing that suffering. It is unclear how one can participate in Christ’s sufferings if Christ suffers that from which we are freed. This is true especially if the Cross is where God suffers that particular godforsakenness (even “spiritual death” as Fleming Rutledge urges) which is the consequence of our sin. What is there to participate in? 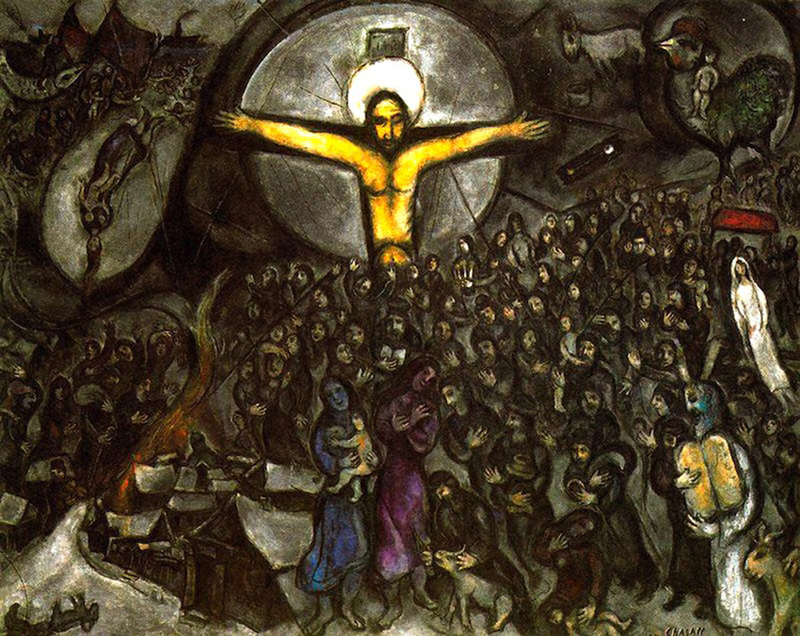 A participable cross renders penal construals of Christ’s suffering untenable. What we require, then, is a notion of substitution (if that’s a fair word to continue using) that admits participation, a suffering on our behalf that is vicarious and effective by means of the mode of participation it offers. Every analogy fails, and maybe readers can improve upon mine, but Roger Bannister comes to mind. In 1954 Bannister became the first athlete to break the 4-minute mile, and once he accomplished it others quickly followed in his stead. What was thought impossible (breaking the 4-minute barrier) before Bannister subsequently became commonplace. The breaking forth of achievement after Bannister is no coincidence; his solitary representative act occasioned new possibilities for others. Similarly, Christ can be said to take our shared humanity to the abyss of the Void and there face our finitude and mortality under the conditions of our own violence, not so that we need not face the Void and die there, but because we must, and so that we may do so without falling into despair and misrelation (Heb 2:14). He suffers not spiritual death – God forbid – but he abides confident of God’s love and obedient to it in those conditions which in us occasion despair and spiritual death, thereby creating a pathway for us to follow in his stead. In addition, Christ’s sufferings manifest humanity’s truest possibilities in a manner no other is able to achieve because of his unique innocence. Thus, the substitutionary role is real, for only so innocent and willing an assumption of our condition by Christ in our stead could expose and disarm the reigning sacrificial economy (Col 2.13-15) and in so doing invite us to follow in his stead. Substitution becomes participation. Let us come round to Hebrews then, a letter commonly interpreted as championing a substitutionary view of Christ’s sufferings. I was taught that where the blood of animal sacrifice failed to atone, Christ’s blood succeeded because with Christ the sacrificial system finally landed upon just the right sacrifice. I want here to argue precisely the opposite – that in Christ this economy is finally shown to be an altogether failed and bankrupt mode of relation to God. Hints of this appear in the OT, some of which the author of Hebrews relies on. Take the prophetic reminder (Hos 6.6) that “I [God] desire mercy not sacrifice, and acknowledgement of God rather than burnt offerings,” echoed in Ps 51.17 as well, “You do not delight in sacrifice or I would bring it; you do not take pleasure in burnt offerings.” These inform the author’s critique of sacrifice. Heb 10.8 as well: “First he said, ‘Sacrifices and offerings, burnt offerings and sin offerings you did not desire, nor were you pleased with them’ though they were offered in accordance with the law.” This closing line of commentary is telling, for it suggests that when the writer follows with “Here am I, I have come to do your will,” he cannot mean to extend that same economy with Christ, introducing a source of blood that God is interested in. On the contrary, we see rather the lengths to which God will go to demonstrate how antithetical blood sacrifice is to him. How can God get across to Israel how uninterested he is in blood sacrifice? How can this economy be shown to be bankrupt? To manifest this Christ submits himself to its sacrificial logic, lets it exhaust all its resources upon himself, and then manifests God’s contradicting verdict from beyond the grave. Thus Christ exposes the mythology upon which that entire economy of relation is predicated. Only resurrection from the execution prescribe by the law could reveal this. The abandonment on the cross which separates the Son from the Father is something which takes place within God himself; it is stasis within God – ‘God against God’ – particularly if we are to maintain that Jesus bore witness to and lived out the truth of God. We must not allow ourselves to overlook this ‘enmity’ between God and God by failing to take seriously either the rejection of Jesus by God, the gospel of God which he lived out, or his last cry to God upon the cross. If we cannot condemn this, we owe Arius an apology. I grant the irony of an Evangelical saying such a thing, but I offer it nonetheless. Note that Moltmann is no fan of penal substitution. It is purely in terms of loving identification that he understands the Cross. But identification with what precisely? In Moltmann’s view, Christ identifies with the actual godforsakenness that is the consequence of our sin. But while no one doubts that Christ does identify with our natural human condition, we cannot construe that identification in non-participable terms. Even Rutledge in her profound work on the Crucifixion commits this error. Not only must Jesus die as a consequence of our sin, which is hardly deniable. He must suffer the consequences of our sin. The Cry (Why?) demonstrates that Jesus “embodies in his own tormented struggle all the fruitlessness of human attempts to befriend the indifferent mocking silence of space.” Christ “is suffering the curse and the defilement that would have fallen upon them—that is, upon us.” Jesus was “utterly cut off from his powers, from his Father, from any hope of redemption or victory” and therefore “suffered what the book of Revelation calls the ‘second death’…as our substitute.” Jesus “exchanged God for Godlessness” and was made to be sin. “Does this mean that Jesus became his own Enemy?” she asks. “It would seem so.” There is nothing to participate in here. The Cross has become commiseration. Odd, don’t you think? Besides declaring that his Father would be with him in his upcoming ordeal, Jesus states explicitly that he wants his disciples to understand from how he suffers how they shall possess his peace in their own upcoming afflictions. How the Father would be with Jesus in his suffering is thus how God is with us in our suffering – precisely the opposite point which interpreters make who view the Cry as expressing Jesus’ utter spiritual dereliction and godforsakenness in terms Moltmann and Rutledge describe. Perhaps Jesus was mistaken. Perhaps he encounters on the Cross a horror he did not expect, namely, the realization that the Father had abandoned him, an abandonment which, Moltmann argues, is the only thing that can make Jesus’ sufferings unique and efficacious. But alas, such suffering is not participable, and such a view has also to assume Jesus is being described as having fundamentally misunderstood the very nature of his own passion. In the Psalmist’s piercing Cry that Jesus utters on the Cross, God recreates humanity ex nihilo (as it were) – via Christ’s humanity (God’s own humanity), God takes creation to the very edge of that nothingness from which we are called into being, and there humanity finally relates to God truthfully and peacefully in the face of its finitude. Christ takes the essential question at the heart of the Cry (Ps 22) and submits himself to the Father as its answer for all of us. This is identification to be sure, but not with the godforsakenness of a broken and despairing mind. Rather, the Cry becomes a point of departure where we can locate ourselves within the event of the Cross and there participate in the unconditional acceptance of the Father in the truth of its freedom and independence from every created source. Finitude must ask Why? Where is God in this? On Jesus’ lips it tells us that he is standing at the very place before the Void which marks the spot of humanity’s absolute dependence upon God over the abyss of its own nothingness, and that where we fall into misrelation and despair, Jesus surrenders himself peacefully and in loving trust to his Father. Jesus then does not die spiritually, suffering the second death, rather, he fully lives under the full weight of created finitude abandoned by its own and bereft of every creaturely support. He asks our question, and he asks it from the regions of suffering that only so innocent a victim can know, and the answer he gives is how and where he offers his sufferings to us for our participation and salvation. Thank for letting a JV player up to bat with the Major Leaguers. Thank you Tom for unpacking this issue, it is quite powerful. ‘the peace Jesus leaves his disciples prior to being crucified he actually possesses and embodies as he is is murdered, and that only if his own assurances are true for him then and there can they be true for us’ To add to this, God’s full hypostatic participation in our humanity is the condition which makes possible our participation in Him (his suffering, his victory). This would seem to demonstrate the necessity of the incarnation for a salvation not by way of mere substitution but by participation. He must partake of our nature so we can partake of his nature. With talk of ‘nature’ however, the foundation of participation and substitution radically shifts from action to ontology. The truth of the will to endure death is not the demonstration of the event in history, but ‘prior’ to this – in the very being of God, of who and ‘what’ God is. It is in this truth, His being, in whom we are invited, and enabled, to share. I wonder if St Peter seems to be hinting to this in 2 Peter 1, ‘His divine power has given us everything we need for life and godliness through the knowledge of Him who called us by His own glory and excellence. Through these He has given us His precious and magnificent promises, so that through them you may become partakers of the divine nature, now that you have escaped the corruption in the world caused by evil desires.’ The effect for our thinking about salvation is that the cross is not the exclusive focal point, and thus this would seem to lessen the conflict between substitution and participation. The ontology of participation attenuates punishment. Enablement, rather than substitution, becomes the operative term. Tom is the above helpful and congruent to your point at all? I meant to pose the comment as a question. I tried to note up front that salvation, as you say, shouldn’t be thought in terms of just the Cross. Once salvation is grounded in the entirety of the Incarnate life/death/resurrection, it becomes, I agree, untenable to view the Cross in non-participable terms. I focused on the Cross because I needed to see for myself that this wider view could be articulated in terms of the individual acts as well, and the Cross is one of those acts; i.e., what would it look like to articulate specifically the sufferings of Christ in participatory terms? It’s there explicitly in the NT but I don’t think many notice. How many works on atonement, for example, take Jn 16.31-33 into account when attempting to describe what’s transpiring on the Cross? I’ve never run into theories of the atonement that reflect upon those passages. What I think you demonstrate is that if participation in God’s being is the preferred soteriological model then participation should translate into the sharing of particular operations of that divine nature, the endurance of the passion on the cross being of course one of the chief accomplishments. Jesus’ donation of peace is astonishing, the timing and circumstance and his knowledge of the events soon to take place. Perhaps with this participation in mind, the inexplicable reaction of martyrs to their persecutors come to light. In Eastern Orthodox parlance martyrs are often referred to as “God-bearers.” Take for instance Stephen’s extending forgiveness while being murdered. A mere man, but one would have to say, a God-bearing, deified sharing-in-the-divine-nature man. I otherwise don’t have a coherent explanation for these type of accounts. “passion bearer” is another such term for saints. Winning! Nicely done, Tom. I wish this understanding would begin to gain common currency across Christian denominations. Philip Sherrard talks about how in the West, when folks see a crucifix, they see a man suffering. They don’t see a king liberating creation. This is the legacy of late medieval and Renaissance theology that was carried forward into modernity. I think Tom has indicated a soteriology that returns kingly sovereignty to the center of Christ’s act. Thanks for your thoughts on how Jesus’ life, murder and resurrection subvert conventional wisdom, and in so doing give us all the potential to participate in the Kingdom. Fantastic essay. This confirms my rejection of penal substitution. One thing really hit me while reflecting on your essay. Under the lens of penal substitution we might say that those who were cursing Christ while He was on the Cross revealed the heart of the Father toward the Son at that moment of dereliction. In other words, penal substitution would lead us to believe that those who cursed and abandoned Christ on the Cross were the real faithful cursing the Victim with the Father. The Apostles who abandoned Christ in his hour of need would be perfect as the heavenly Father is perfect, while Mary and John who stayed near the Victim stayed with a false compassion. The former participating in the wrath of the Father, the latter participating in the “sin” or “dereliction” of the Son. Thanks Nick. Glad it clarified things for you. How many times do we speed past Jn 16.31-33 and its implications? I remember the moment those words tripped me up and redirected my approach to the Cross.